Fat: Good or Bad? The most concentrated source of energy of all the nutrients are fats: 1 g fat gives 2.3 times more energy than 1 g of proteins or carbohydrates. Also fats dissolved vitamins for delivery to the organs and tissues, protects the body from excessive heat, depositing in the subcutaneous tissue, and protect the internal organs from the rough mechanical action. The lack of fat in the diet can lead to a number of serious disorders of vital activity. Triglycerides can be of two types. Glycerin. Itself belongs to the category of alcohols and dose not form fats. In addition, in glycerin are observed properties of carbohydrate – low calorie (4 calories per 1 gram). It is found in many diet products and is responsible for the pleasant smell and consistency. Saturated fatty acids. Contain a large amount of hydrogen atoms, it is poorly digested, disrupting cells. 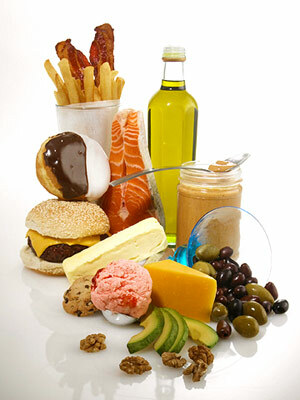 Saturated fats are found in abundance in foods such as beef, lamb, pork, dairy products, cocoa. Read moreFat: Good or Bad?